Happy Birthday to all those born under the constellation Leo – July 22nd through August 21st! I’m a Leo myself, so I thought I’d share the fun and have a little giveaway. 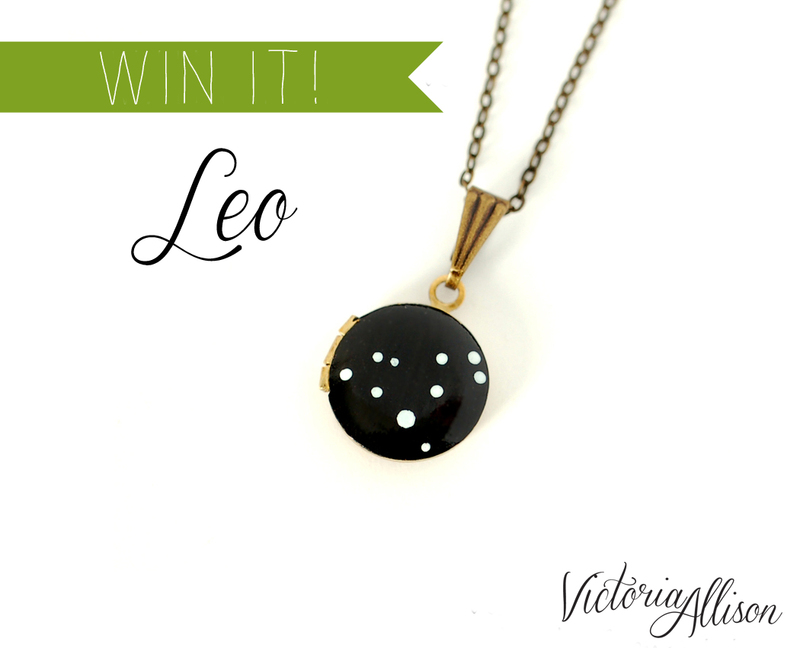 From now until August 1st, you can enter to win your own hand-painted tiny constellation locket, featuring the Leo constellation! I hand paint the design onto a petite vintage brass locket, and finish it with a protective jeweler’s resin for a glossy shine. 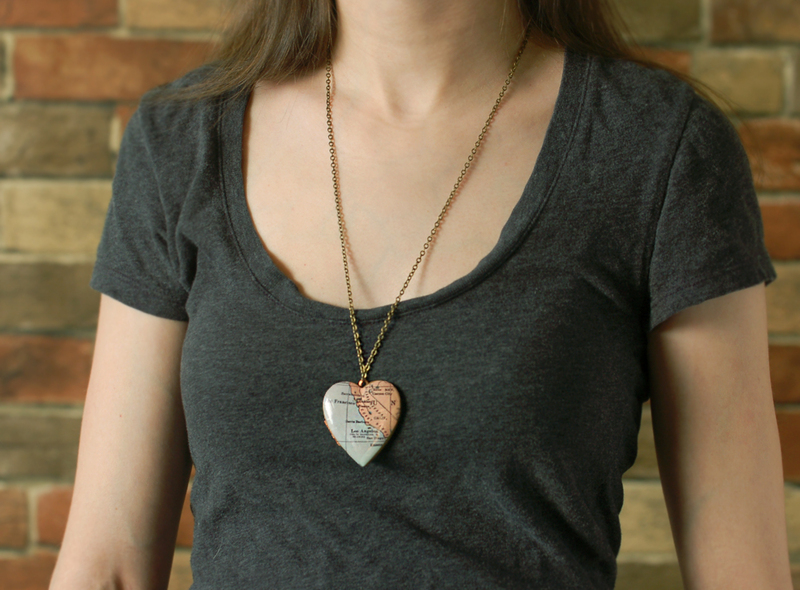 Your locket will arrive on an antiqued brass chain, in your choice of length up to 20-inches long. You can enter up to two times .. Entries must be received by 10am PST August 1, 2014. Giveaway valid for US mailing addresses only. The winner will be selected by a random number generator around noon 8/1. Good luck! Time’s up! The winning number has been randomly selected. Congrats, Jessica! Behind the scenes at Victoria Camp Designs – Fab.com sale wrap up! 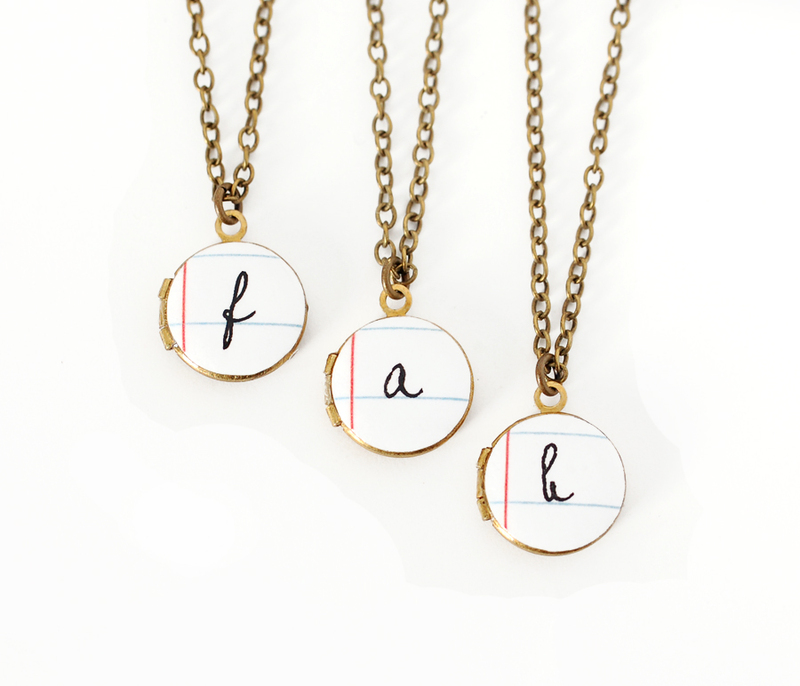 Oh my – I can’t believe it’s been almost a month since my sale with Fab.com! When my sale started, I’d created half of the available inventory up front so that it would be ready-to-ship upon purchase, and the other half was made-to-order. I was able to send my first big shipment the day after my sale ended, and sent the second shipment less than a week later. As of early last week, all of the merchandise has been received at their warehouse, which means it should be in most customers’ hands by now! Hooray! It’s sort of funny that no matter how much prep work you do, once the sale starts, it’s still a (happy) whirlwind! I thought it might be nice to share a few ‘behind the scenes’ photos from my sale event with you.. I took the above photo before I got started. 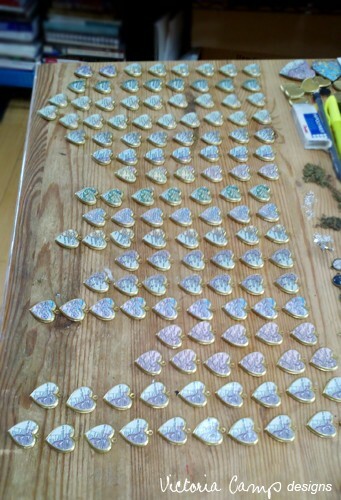 I used almost all of these lockets for my sale. Doesn’t it look so daunting?! I spent a an entire month preparing the inventory for my sale, before it went live. 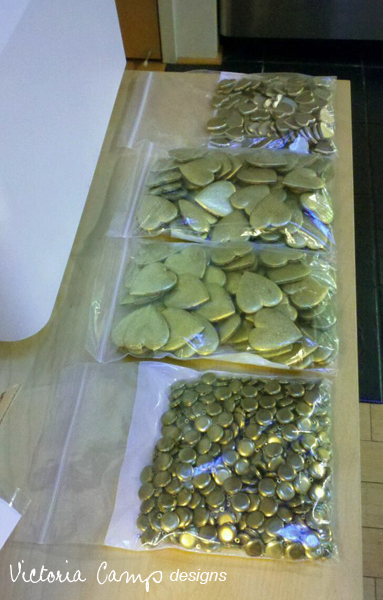 Prepping large heart lockets and tiny constellation lockets for the Fab.com sale! First shipment ready to go! My sale event was 3 days long, and I could hardly sleep the night before it started; I was so excited! I joked with my mom (who lives 3,000 miles away) that I spent all 3 days just staring at my computer, watching the ‘sold items’ number increase. She would routinely check in with me by email, asking, “What’s the current number?” We both got a kick out of watching the little red “sold out” flag appear on the item styles. The morning after the sale ended, I had the final item numbers and could begin gathering all of the ready-to-ship pieces for the first warehouse shipment! 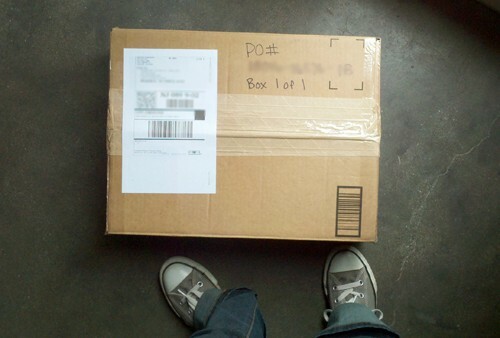 At this point, I was feeling pretty thankful that I had already packaged and labeled each item individually. 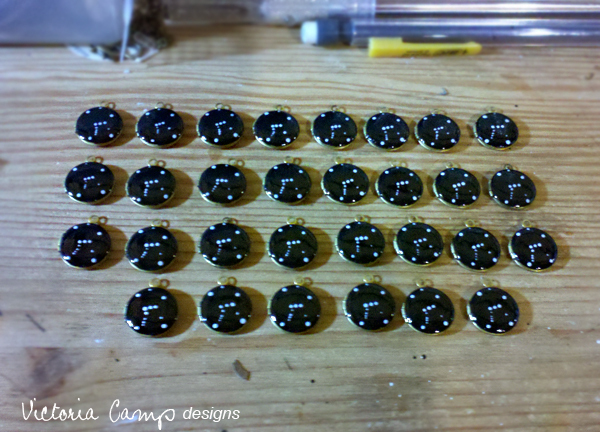 It saved a LOT of time later on.. time which I now needed to finish up the made-to-order items! 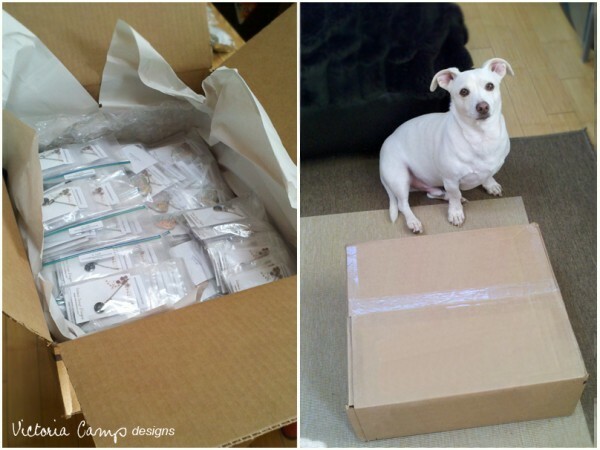 The box for the first shipment was so large, I just had to take a photo of it next to my “floor manager,” Butters, for comparison. I think he was disappointed that the box did not contain any treats for him. Sorry, Butters! 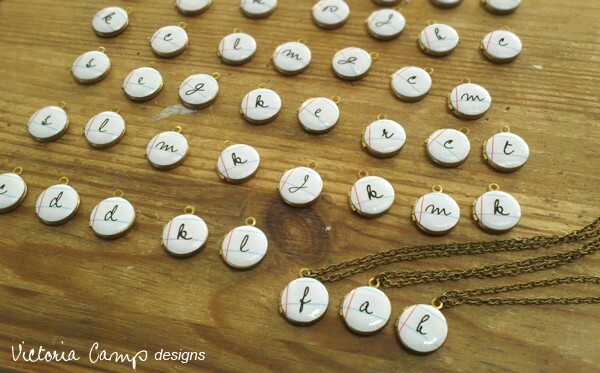 Tiny Initial Notebook Locket Necklaces in progress..
Small heart map locket necklaces in progress.. The second item style I needed to complete were the small heart map locket necklaces. I offered 15 different cities for the sale event, and made sure to double and triple check the quantity of each city that sold. The most popular cities were Los Angeles, San Francisco, and New Orleans. (The first two didn’t surprise me – although the third one did!) San Francisco has always been one of the popular locations. Can’t say I blame you guys, as I do live in the Bay Area myself! 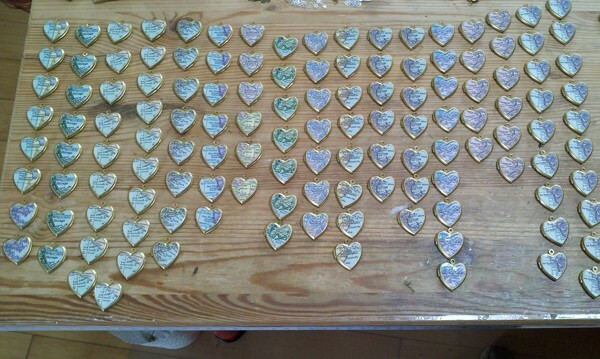 Another view of the small heart map lockets..
An overhead view..I still can’t get over this! 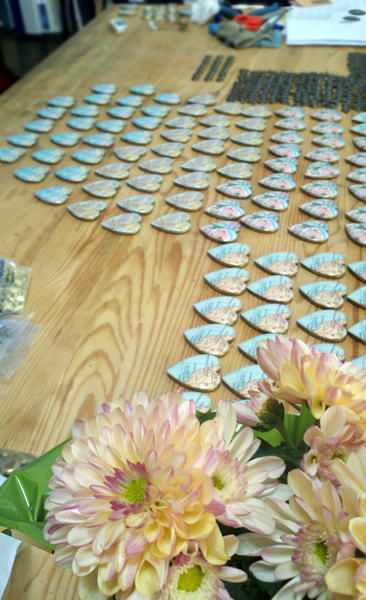 I’ve never seen so many map lockets on my table at one time! This photo didn’t even include the lockets that I’d completed earlier. Crazy. I spent the week after the sale trying to relax a little bit, and working on custom orders. This week I am back to what is a little more “normal,” and have finally had some time to work on new designs. Hope everyone is having a great March! I promised you last weekend that I would come back here and tell you the fun news this weekend..
Well, here it is – I’m having a sale event on Fab.com! The sale runs until 8amPST on Wednesday morning, but I expect some styles may sell out before then. Please keep in mind that I think the links will only be active until the sale ends. I’ll try to remember to update this page after it’s over so no one is confused. Happy July! Well, okay, it’s already the third day of July, but I didn’t miss the start of the new month by too far. For the entire month of July, I’m offering free shipping worldwide on all orders in my shop. I’m also going to be hosting another giveaway, but not until later, so you’ll have to be patient! If you want to be the first to know about special events and promotions, I encourage you to sign up for my Facebook page. I always post new news/items/specials there first. 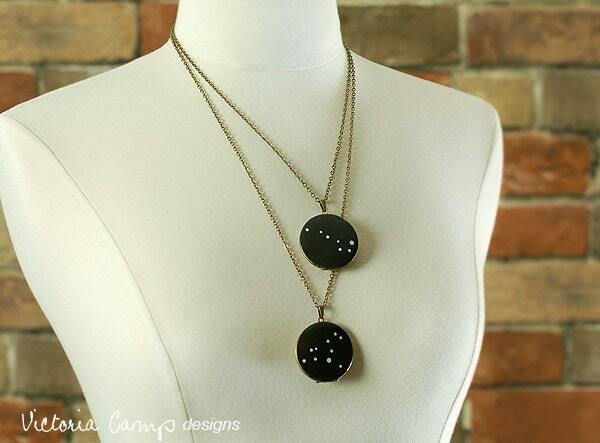 I’ve also added some new constellation jewelry styles the past week.. 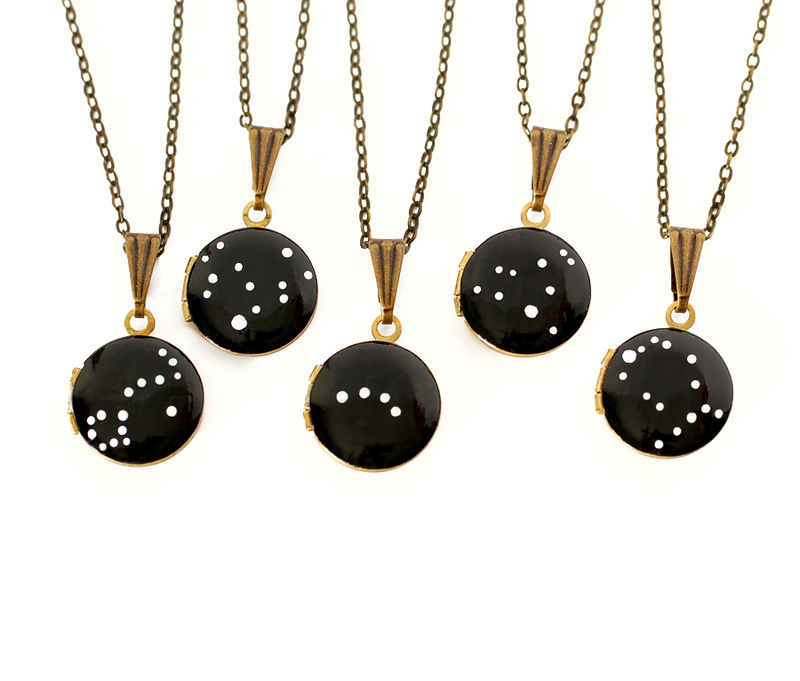 The alternative to the tiny constellation locket, for those who prefer a bigger, bolder style! I love these ones too, since they’re big enough to put in 2 photos and/or a secret note. 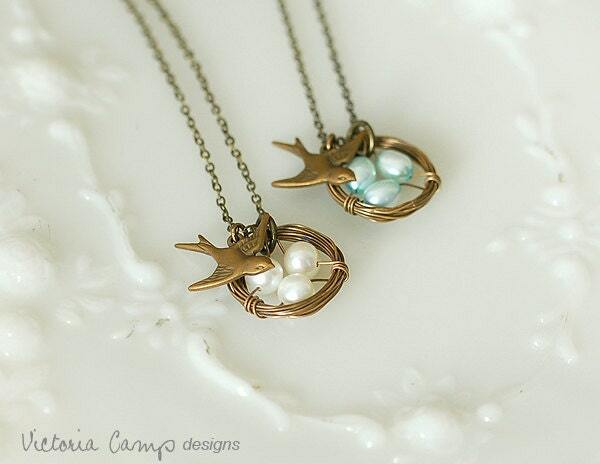 I’ve also added a new petite bird nest necklace, with freshwater pearls..you can choose either white or pale blue freshwater pearls! 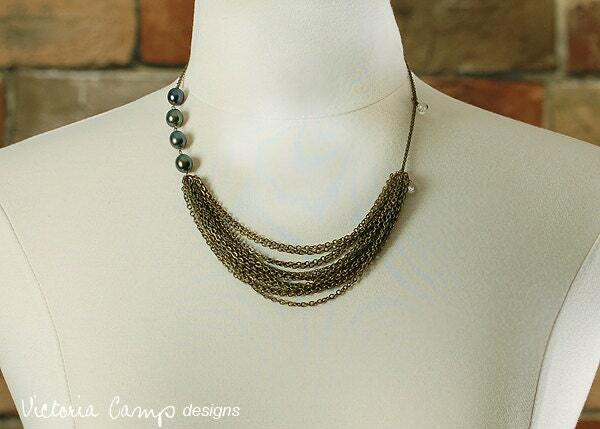 ..and this one-of-a-kind layered brass necklace with the most beautiful dark olive green freshwater pearls. I’ve been sort of “hoarding” these pearls for a while. I’ve only used them in one pair of earrings, and now this necklace. I only had a half of a strand of them to begin with, so I’ve been selectively using them. They’re just too pretty to use on any ‘ol design! This asymmetrical design features White Topaz on the opposite side of the chain, and multiple layers of brass chains in the center front. Very dramatic! If you live in the US, have a safe and happy Fourth of July tomorrow! I’ve been interested in stars and zodiac since I was a little girl. In middle school, my sister and I used to always hunt for Orion’s Belt and the Big Dipper constellations in the sky. We also made beaded jewelry together with zodiac beads that we made out of polymer clay. In fact, I still have two of them left! It was only a matter of time before I added a zodiac/constellation line to my collection. I took a picture of those clay beads (made over 15 years ago!) in comparison to my new line. Funny how time goes by, yet our passions stay the same.. 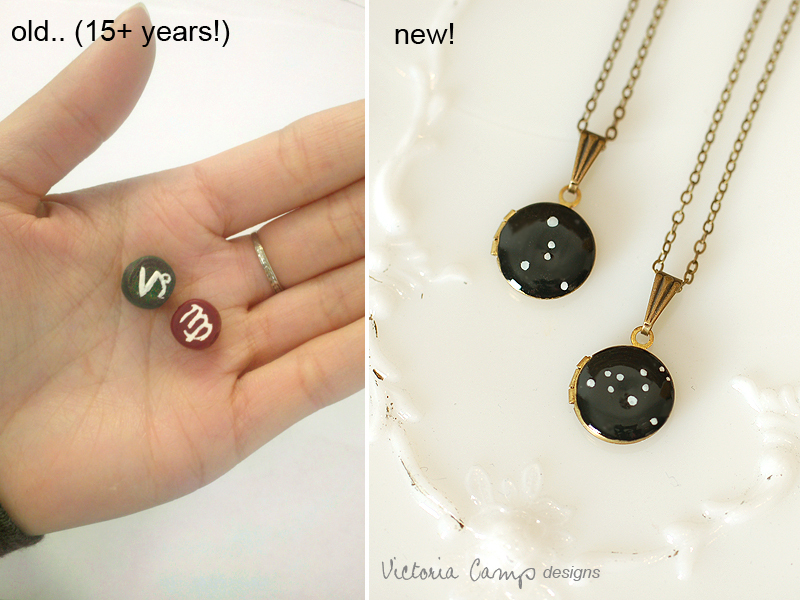 Naturally, I had to make the entire line of zodiac constellations for my shop! They’re available on brass chain, your choice in length up to 20″. Each tiny locket (they’re vintage) is hand painted by me, and then sealed with a glaze to add shine and some water resistance. I think they look great layered.. shown below are two of the necklaces in 20″ and 16″ lengths. Naturally, this post wouldn’t be complete without the addition of an Ursa Major (“big dipper”) constellation locket necklace.. In case you’re wondering – I absolutely did make myself an Ursa Major locket to keep! I’ve been wearing it along with my Leo locket. I’m thinking about making some additional constellations, by request. Any suggestions? 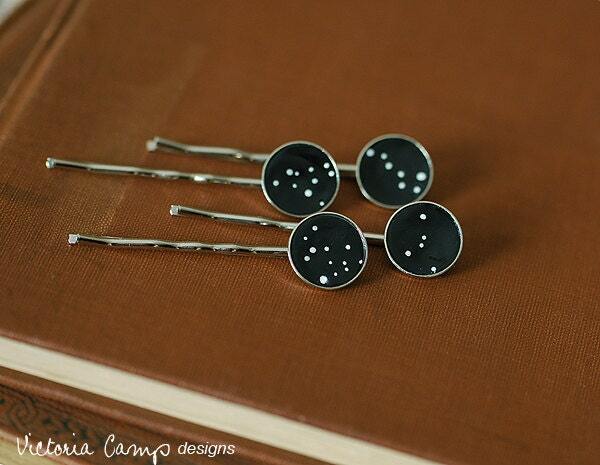 What’s your favorite constellation?